작전 중 가장 피해가 심했던 오마하 해변. 노르망디 상륙 작전은 1944년 6월 6일부터 1944년 7월 중순까지 이어진 전투이다. 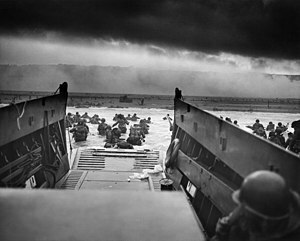 ↑ “Frequently Asked Questions for D-Day and the Battle of Normandy”. D-Day Museum. 2013년 6월 21일에 원본 문서에서 보존된 문서. 2007년 11월 10일에 확인함. Note that casualties are for 6 June 1944 only. ↑ “Frequently Asked Questions for D-Day and the Battle of Normandy”. D-Day Museum. 2013년 6월 21일에 원본 문서에서 보존된 문서. 2007년 11월 10일에 확인함. 이 문서는 2018년 12월 17일 (월) 17:06에 마지막으로 편집되었습니다.